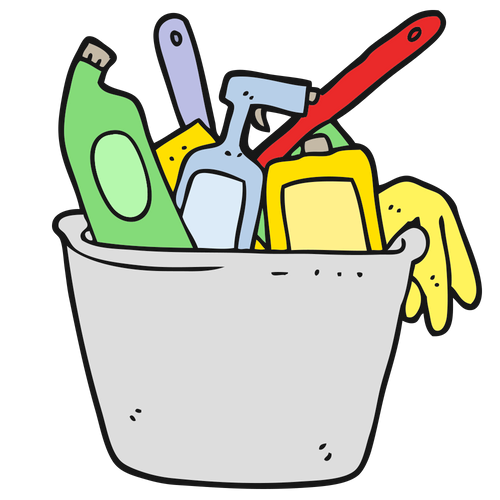 The end of the school year is a time when many teachers find themselves cleaning up their classrooms and files and beginning to organize things for the next school year. While it is often more obvious that the physical classroom needs to be organized at the end of the school year, so do our digital classrooms and storage spaces. Now, is a great time to clean up and organize your Google Classroom(s) and Google Drive. The following tips will help you clean up your digital classroom and files as you close out one school year and prepare for the next. When students submit their work through Google Classroom, Google automatically changes the permissions of the file(s) that were submitted making the teacher the owner and reducing the student's right to "view only." While this is helpful when having assignment deadlines and grading students' work you don't want to leave it this way. After you have graded assignments you want to make sure to return the work back to the students so that the ownership and access permissions of these files revert back to the students as well. This is critical to remember when you are cleaning up your Google Drive folders and files. If you do not return the assignments back to the students and you delete these files from your Drive you are really deleting the file. However, if you return the work to the students and they resume ownership of the files when you delete them all it does is remove the file from your Drive. If you prefer not to have students accessing content, assignments, information, etc. from your class you can un-enroll them and remove them from your Google Classroom. When you are done with a digital class you can archive the class so that your Google Classroom current class list is cleaned up. Archiving a Google Class not only removes the class from the list on your main Classroom homepage, it also freezes the class so that no new changes can be made and allows you to still reuse posts and assignments in new Google Classrooms. Many teachers don't realize that as they use Google Classroom, Google automates the workflow and organization by creating class folders and assignment folders in your Google Drive as you use Google Classroom throughout the year. Every time you create a class in Google Classroom a folder is created for that class where all the assignment documents and other files are stored. 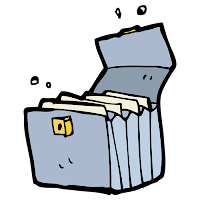 It is important to know that you are able to move class folders in your Google Drive to a new location so that only the current class folders and files are easily visible. I recommend that you locate your "Classroom" folder in your Google Drive. Within that folder, you can create a new folder and name it "Archived." Now you can simply drag and drop the old (archived) class folders into the new folder you just created. Moving Google Classroom folders doesn't change anything in your Google Classroom or with file permissions. 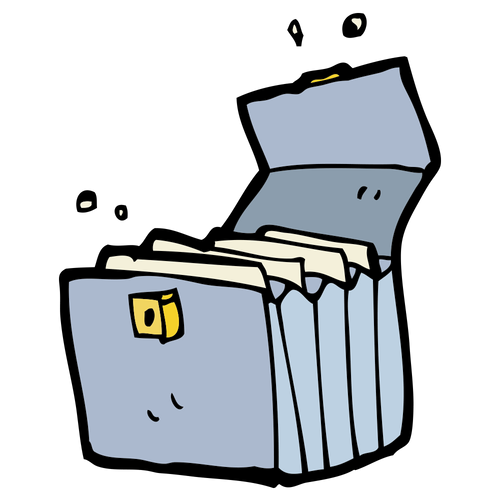 It just allows you to more quickly and easily find your current Classroom folders and files. Not only does Google create folders in your Google Drive to organize your digital class it also creates a Google Calendar when you create assignments with due dates. The calendar is a great way for students and teachers to see upcoming due dates for class assignments and projects during the school year. When the school year is done you don't need the calendars from your Google classes cluttering up your calendar list. You can prevent this by either hiding these calendars or deleting them from your calendar list. Elevated heartbeat, sweaty forehead, and the anxious anticipation of whether I will escape. Yes, I am referring to the challenge of an escape room. There's nothing like that feeling of anxiously working to uncover the clues and escape the room. As a teacher, I liked to challenge my students to answer mentally puzzling questions or riddles. My opening activity was always a riddle. This served as a way to get them focused and ready to think critically. Another activity that I enjoyed incorporating was a scavenger hunt that I'd create using whatever unit or lesson we were focusing on. Much like scavenger hunts and escape rooms--Breakout boxes incorporate the same elements. Students have to critically think about clues to uncover the answer and if they are working in teams they must use collaboration and communication skills to break open the box. Breakout boxes have gained popularity this year. As I have observed different classrooms at different schools around the Las Vegas valley, I have seen students breakout or at the very least attempt to breakout. Students must uncover clues and work with each other to unlock the many locks on the breakout box. BreakoutEDU.com has a plethora of ready-made breakouts for a fee, but I have seen many Nevada Ready 21 digital coaches and teachers make their own customized breakouts for much less. Units, lessons, and books from every content area can be customized into a breakout. If you are interested n having a breakout happen in your classroom, do not feel like you must use the traditional box and locks. There are digital breakouts that have the same effect and the best part is---they're free. If you want to know more about Breakouts in the classroom, here are some resources to get you started. Note taking is a skill prized by teachers and professors but the process is often disliked by students. After all, note taking is difficult work that requires active listening, the processing of information on-the-fly, and synthesizing shorter messages, sometimes involving symbols, that hopefully convey the spirit of the original, longer message. Setting our students up for success in this process is critical to their developing this skill over time. If teachers do it right, students will have a skill they can bring with them to college, their career, and beyond. In this blog post, we will explore analog and digital note taking ideas teachers can use in their classrooms tomorrow. 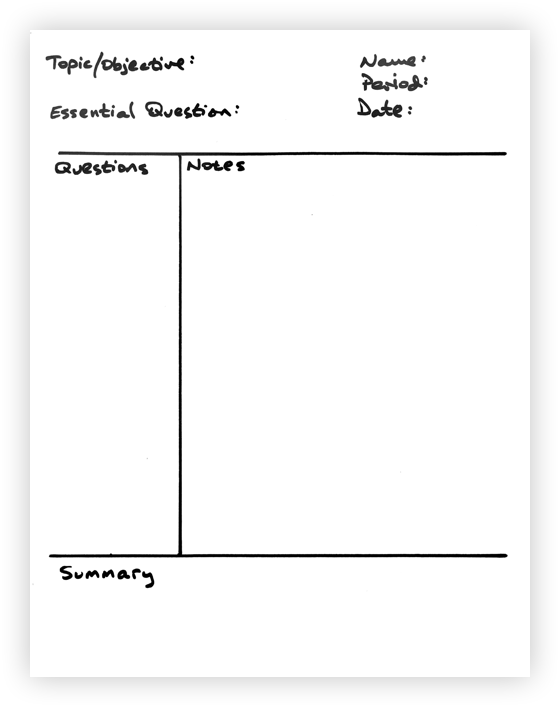 The Cornell Note system has been around since the 1940s. The system was developed in response to observations a professor made of his students at Cornell University. He noticed students struggled with taking notes from scratch and studying from them. The Cornell Notes System was born! Students are asked to draw a vertical line 2.5 inches from the left side of a notebook page and a horizontal line 2 inches up from the bottom, as shown in the image on the right. The resulting two columns have specific roles. The column on the right is for notetaking and the column on the left is used for students to write higher-order thinking questions based on those notes. The idea is that when students study, they can cover up their notes and try to answer their questions. If they need a little extra help answering their questions, they can peek at their notes to find the answers. The bottom section of the note page is reserved for writing a summary of the notes, which is helpful when studying but it also forces the students to go back through their notes and translate them into a shorter paragraph. Some teachers reserve the larger column on the right for content other than notes. For example, a teacher might ask students to glue a reading passage or a list of vocabulary terms onto the page. If students create concept maps, they can draw them in this section, too. One of the challenges teachers face when transitioning to a 1:1 classroom is what to do with student notes. Way back in 2016 BC (Before Chromebooks), teachers lectured from PowerPoint presentations as students quickly scribbled down notes into their notebooks. But in 2018 AD (After Device), some teachers found the notebook option lacking, especially with all of the things you can do with Google Docs. The Cornell notes method of notetaking works great when students are using notebooks, pencils, and paper. Teachers working at 1:1 schools, however, may want to harness the power of Docs and transform notetaking with peer-reviewed digital notes. Teachers can increase collaboration between students, which is one of the skills identified by the Partnership for 21st Century Skills as important for today's students to master. To get students to collaborate with one another, pair students up and make both partners peer-reviewers. Students can share their notes with their collaborative peer reviewer and help one another come up with annotations, ideas for questions, and a review of summaries. Like the Cornell Notes setup, the peer-reviewed digital notes use columns. 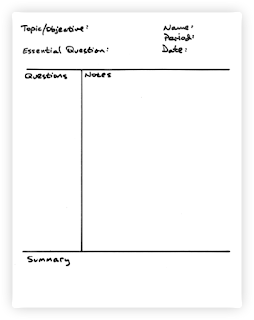 There is a column for higher-order thinking questions students can write based on the content of the notes and a section to write a summary of the notes. 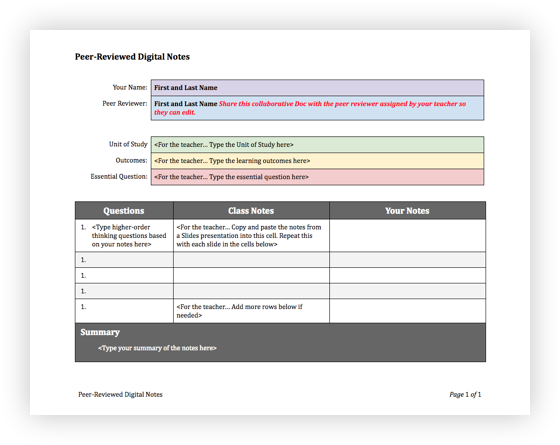 But one of the biggest differences between the peer-reviewed digital notes and the Cornell Notes setup is that the teacher provides the notes to her students. The idea behind giving the notes to the student is that this frees the student up to synthesize their own notes in the third column. Students can use the power of Docs to define vocabulary terms they might not know, and to add images, links, and additional research to their notes. Want to make the note taking process more visual and access your students’ creative side? Sketchnoting can do just that! Mike Rhode, author of The Sketchnote Handbook, says, “Sketchnotes are rich visual notes created from a mix of handwriting, drawings, hand-drawn typography, shapes, and visual elements like arrows, boxes, and lines.” Taken together, sketchnotes can convey the overall big ideas from a lecture or reading. Why should teachers bring the sketchnoting practice into their classroom? When students use sketchnoting to take class notes, students become active listeners as they translate the written and spoken word into a visual representation of the discussion. Students use their critical thinking skills to do this, which is one of the 21st century skills identified by the Partnership for 21st Century Learning as important for students to be successful in college and career. Studies have also shown that “longhand notetakers outperformed laptop notetakers on conceptual understanding and long-term recall” (source). 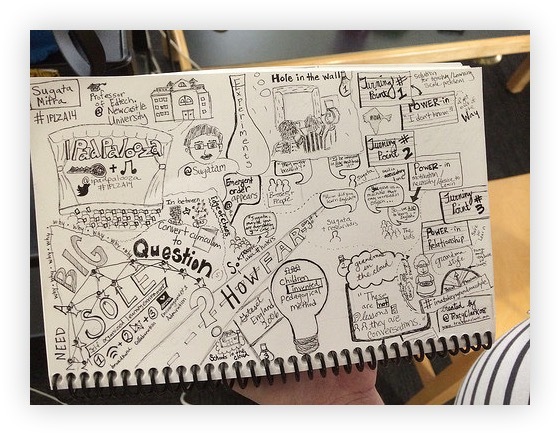 If a teacher wanted to integrate sketchnoting in their classroom, she should start small at first. Teachers are encouraged to take it slow with students at first and model the process as much as possible. One way to do this is through a “Think Aloud.” During this strategy, a teacher explains their thinking behind why they chose a specific image to draw, or placed an arrow, or wrote text, for example. Watch this YouTube video that explains the basics of visual note taking. The image above is used with permission from Creative Commons and was created by Wesley Fryer. Slides presentations are classroom staples used to transfer knowledge from the teacher to the student. This "sit-and-get" style of information input, however, can be very teacher-centered. Note taking doesn't have to be so one-sided! You can make note taking student-centered by having your students create concept maps as notes. Concept maps help students organize their thinking, and are made up of a series of terms or concepts linked by connecting phrases. The concepts are enclosed within a rectangle, which are called nodes. Students draw arrows and create connecting phrases between the nodes. Teach your students to build simple concept maps by imagining the two nodes and the connecting phrase are parts of a sentence. Node 1 is the beginning of the sentence and node 2 is the end of the sentence. The connecting phrase links the beginning with the end. Look at the green graphic for an example of a simple concept map. Note how the direction of the arrow tells the viewer which direction to read the concept map. From there, students can begin to add more nodes and connecting phrases to their concept map. I tell my students to add interconnections between nodes so their concept map looks like a spider web rather than the spokes of a bicycle tire. Teachers can use the number of interconnections between nodes as a type of formative assessment. 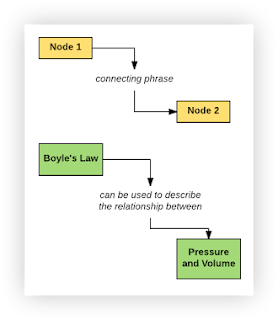 The more interconnections between nodes and the more web-like the concept map, the deeper the understanding of the content. While concept mapping should be mastered first with pencil and paper, students can eventually transition to an online tool like Drawings or Lucidchart to create and share their concept maps. Ever since 2009, computer programmers have pushed the limits of what you can do with Google and Chrome through the design of Google Experiments. These web-based apps can pack a big punch and supplement your digital-infused lessons. For example, art teachers can have students study color palettes from famous paintings using the the Art Palette Google Experiment from its Arts & Culture subdomain. Users can upload or take a photo and find other art works with similar color palettes to the one you submitted. Take a look at the looping GIF below to see Art Palette in action! If you can't use this in your art classroom, maybe you can use it for your next interior redesign of your living room! Another cool Google Experiment, Song Maker, can be harnassed by music teachers during a composition unit. Our students can easily make music in Chrome! Students can click on one of the boxes on Song Maker to place a note. Adding more notes can make a song! Students can change the tempo, the musical instrument they're using in their composition, and even the scale. There's a "Mic" option on Song Maker which I did not check out (trust me, I'm doing you a favor) but I'd love to hear from you what it does and how it works! The best part is that once the student saves their masterpiece, the system generates a link students can turn in to Google Classroom or your class's Canvas LMS. Check out my attempt at writing the theme song to Jeopardy... It (kinda) sounds like it! The last Google Experiment I'll spotlight in this blog post is, in my opinion, the COOLEST! You know how sometimes you write lessons that ask students to draw a picture? And every time, it seems, a few of the students say, "But Mister, I can't draw, I'm not an artist!" AutoDraw takes the frustration out of drawing by using artifical intelligence to guess what your chicken scratch is supposed to represent. A professional clip art-style version of your drawing is then swapped out for your doodle. For example, if you are attempting to draw a top hat, the system may guess that it is a top hat or a boat or a shirt or a hot dog or a building or a... you get the point. You choose which of those guesses you want to replace it with. The cool part is now you have a pretty good drawing you or your students can use in a Slide show or in a Google Drawing. Take a look at the looping GIF below to see AutoDraw guess that the lobster I am trying to draw is, in fact, supposed to be a lobster! BoostEDU is a program that supports teachers in transforming their traditional lessons into 21st-century lessons through an inquiry-based self-assessment and guided lesson design process. It's like having your own EdTech Coach sitting right next to you! Megan Kelly created BoostEDU as part of her Google Innovator project in order to create a solution to the traditional sit and get, one-size fits all, approach to professional development for educators. She wanted to develop a program that would personalize professional development for educators and allow them to reach higher levels of SAMR in their lessons, projects, and activities. In 4 easy steps, Megan has created a process for teachers to be able to self-reflect on their current lessons and be able to see how incorporating purposeful technology doesn't have to be difficult. Step 2: The teacher completes a self-assessment of an original lesson to determine their current level of SAMR/ISTE/4 C’s within their lesson. During the survey, they will be able select suggestions and tech tools to “boost” their lesson. These results will then be emailed to them in an editable Google Doc. Step 3: The teacher will use an online, interactive form to transform their original lesson based on their results from the self-assessment. The form will be interactive and offer suggestions for technology integration to assist him/her in building this boosted lesson. When they submit the form, they will receive a digital copy of their lesson plan. Step 4: In this step, the teacher will have the opportunity to share their self-assessment results and “boosted” lesson on a Google Plus Community. After their lesson is complete, they can share the lesson on the BoostEDU website for other teachers to access and use.